You want to impress your friends with temporary Main screen with your own “Search screen”. I said temporary, because it’s only the one display, when you key in your ‘search key’ then it will go back to Google again. Step 2. Enter your search screen’s ‘Title’. Just enter your title in the ‘Enter your name’ text box then click ‘>>Create Now”. Now you have your own Search Screen. 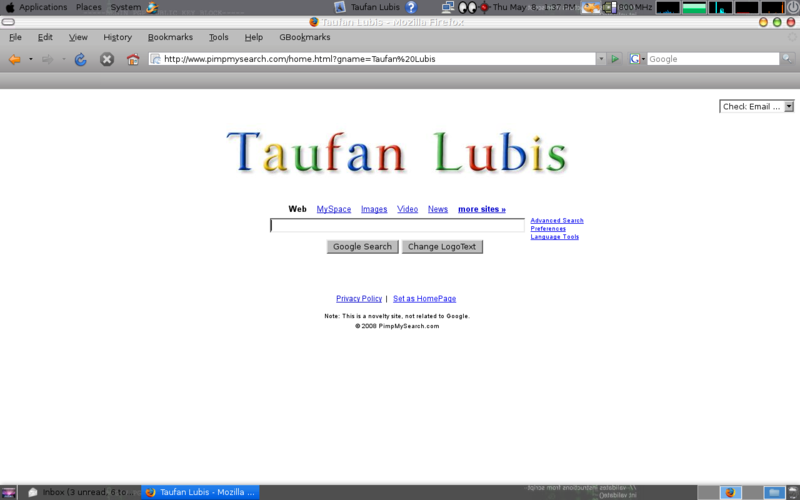 The problem is, you have to type the url address above (http://www.pimpmysearch.com/home.html?gname=Taufan%20Lubis) every time you want to display the page. 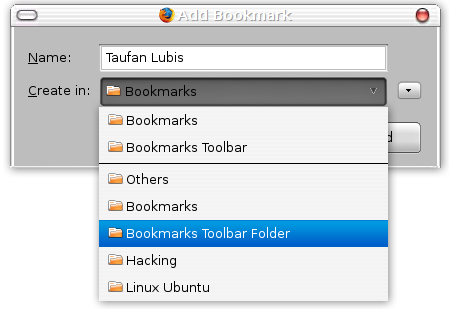 To make it easy, just put in the Bookmarks Tool Folder. Step 3. Add the link to Bookmarks Tool Folder. Click ‘Bookmarks’ and select ‘Bookmark This Page’. 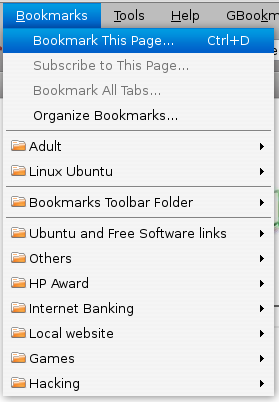 Then choose ‘Bookmarks Toolbar Folder’ then click ‘Add’ button. Your link will be displayed on ‘Bookmarks Toolbar’. Next time you want to display your Search page, just click the link button.Well, now you have your own instant search screen. Better make it your browser homepage, its powered by google search anyway. Hey very nice package. We can see all the name here. Please change it as Venkatesh. Wow,…it would be great, if you actually spoke English. Keep typing that nonsense, abbreviating everything, and you will most certainly forget how to write and spell in a few years. You think I’m kidding! Use your head and make intelligent decisions. Please don’t make our human species appear so pathetic and gullible. 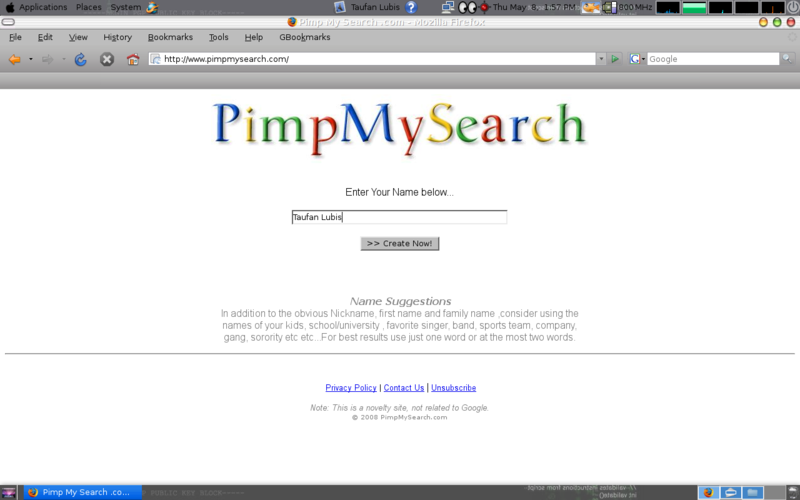 Check out http://www.namegoogle.com it lets you customize google logo with your name! hi all ……. dear tell me some trick plz…………. It’s a very good technique to impress your friend. on May 8, 2009 at 2:40 am | Reply Sasa ROX!!!!! on May 8, 2009 at 2:41 am | Reply Sasa ROX!!!!! on May 8, 2009 at 2:43 am | Reply Sasa ROX!!!!! hello be my friend because i have no friends. at school evryone hates me i get F’s and F- on all my grades because i am a lozer and i love my self. im so popular i get A and A+and i hate my self beacause nobody likes me and i got a dog, my dog hates me waaaaaaaaaaaaa. on July 30, 2009 at 3:29 pm | Reply tieganwalkerr! on December 1, 2009 at 2:43 am | Reply Margaret. I WANT WEBSITE FOR FREE BUT MUST BE LIKE http://www.gamesalltime.com only like this. hi ya men our women! 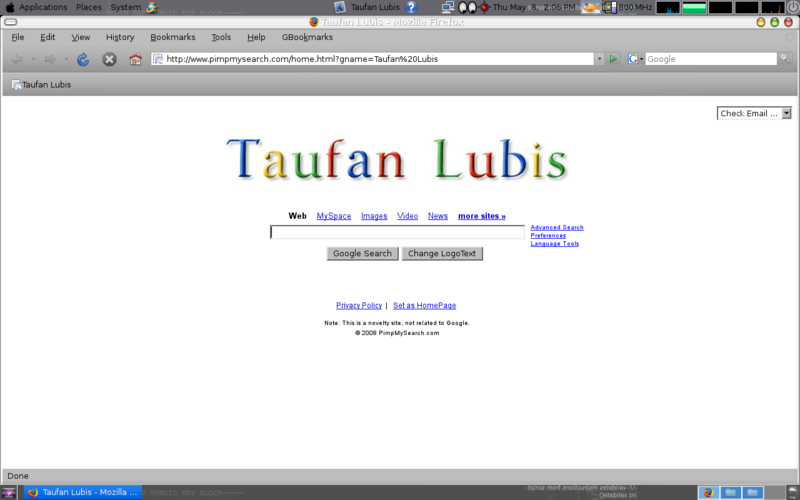 changing google name is cool. i think this web site is COOOOOOOOOL! because people can put names down for the title!!!!!!!!!! hi, i want to make ym name as a google sighn!!! I would recommend to you to visit on a web site, with a variety of content articles on a theme interesting you. http://google website thank yo very much. 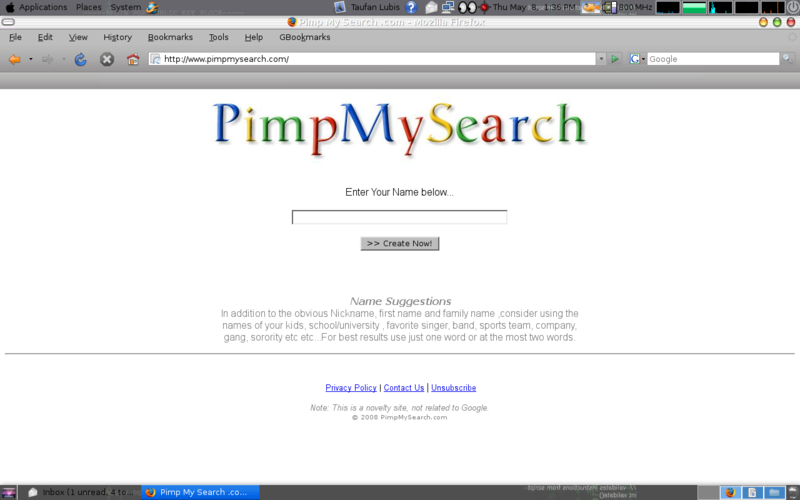 i don’t reach pimpmysearch reach only shiny search could some one help!!!!!! i want display my name in google place guid me please!!! Google Is The Best Thing I ever Had!!! really much more smartly-liked than you might be now. You’re very intelligent. my view believe it from so many various angles.